Exit Day! What Does it Mean for a ‘Transitional’ Deal? The UK Government has announced that it intends to propose an amendment to its own European Union (Withdrawal) Bill to specify the day and the time of the UK’s exit from the European Union. ‘Exit day’ is to be 29 March 2019 at 11.00pm. Under the original Bill, ‘exit day’ would have been decided upon by ministers. 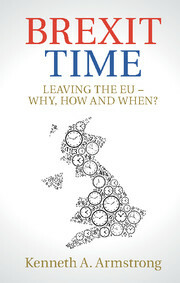 This left open the possibility that the UK and the EU might agree to defer the UK’s withdrawal in order to give the UK more time to prepare for life outside the EU. This option to defer departure as a means of transitioning to a new UK-EU relationship has now apparently been closed off. So what might this new amendment tell us about the possibilities for transition and the domestic legal instruments to implement transition. With colleagues at the University of Cambridge, we have been thinking a lot about how a transitional framework might be constructed, and we wrote a briefing paper in October setting out some options. There are two levels to consider. First we need to think about what is legally possible under the Article 50 process in terms of a transitional framework. Second, it is important then to work out how domestic legislation might interact with an EU transitional framework. Clearly, of particular importance would be how the European Union (Withdrawal) Bill might relate to an agreed transitional arrangement. An Article 50 withdrawal agreement that would contain a time-limited derogation to maintain certain ‘saved’ provisions of EU law. This body of ‘saved EU law’ would continue to impose reciprocal obligations as if the UK were still a Member State. A provisional trade or provisional association agreement. A transitional membership of EFTA and access to the Single Market via the European Economic Area Agreement. A deferred departure from the European Union to give the UK more time to prepare for non-membership. Given the announcement of an exit day that would scupper a deferred departure – unless of course the Bill retains a power for ministers to change that day – and given the political and legal obstacles to either a provisional agreement on the future relationship, or an EFTA/EEA approach, the front runner for a transitional framework would seem to be some sort of continuation of a limited set of current obligations on a strictly time-limited basis. In other words, the Article 50 agreement would seek to achieve something similar to the domestic Withdrawal Bill by trying to preserve key aspects of EU law. Whereas the Withdrawal Bill domesticates EU law lock, stock and barrel, an Article 50 transitional agreement would be limited to saving those key provisions that domestic law alone cannot put into operation, namely reciprocal obligations such as those ensuring trade that is free from tariff and non-tariff barriers. The UK would likely have to concede that any such arrangement would entail acceptance of the institutional arrangements that go hand in hand with these obligations including the jurisdiction of the Court in interpreting and applying those provisions. The problem of this option is that it potentially muddies the waters for the operation of the domestic Withdrawal Bill, whose working assumption even before today’s announced amendment was that there would be a single ‘exit day’. If a transitional arrangement were to save certain EU obligations on existing terms, that would then need to be reflected in domestic law. Today’s announcement might then be a much more important signal that is apparent at first sight. It is possible that the Withdrawal Bill will not seek to manage an EU transitional framework at all. Rather, it’s possible that a new Bill will be proposed that will give domestic legal effect to a transitional agreement. The Withdrawal Bill will domesticate EU law up until 29 March 2019, whereas a new Bill will allow for the continued application of certain ‘saved’ provisions of EU law for the period of transition. The new Bill might look and feel much like the European Communities Act 1972 which is set to be repealed. Indeed, keeping the same sort of constitutional architecture in place may be key to the EU’s willingness to accept any sort of transition on these terms. Politically, replicating aspects of the 1972 Act in a new Bill that would continue to impose EU obligations for a time-limited period would likely encounter strong headwinds from those keen to ensure that the UK leaves the EU by March 2019. The announcement of a specific ‘exit day’ and the removal of an option to defer departure might well be the political bone that the Government is willing to throw in order to make a transitional arrangement more palatable. As a man-in-the-street, retired and an exasperated Remainer, all I see with fixing of the departure date is that it sets in law the date the Brexiters will simply walk away. I don’t think there will be a need for transitional legislation because it simply won’t happen. I wish I knew who was behind Brexit. In other words where is the money. Who is forking out. The Russians, Arron Banks and co.
Who stands to gain in the money stakes. Certainly not the people of this country who do not realise that they may be put onto food rationing within a couple of years. With the Tory MPs being told to sit on their hands, Boris disgracefully still in his job and Parliamentary procedures being ignored, will it come down to some brave people bringing a just outcome through the Supreme Court. I hope so for the future of the youngsters of today and tomorrow. Previous Previous post: The “Direct Effect” of the Withdrawal Agreement: Do Davis and Barnier Agree?